Serena Arthur left the College in 2016 with outstanding grades to pursue an English Language and Literature degree at the University of Oxford. The ex-Holy Trinity Catholic School student achieved all A and A* grades in her A level studies, including English Language & Literature, Psychology and Religious Studies. Her offer from Mansfield College, Oxford came in no small part thanks to her status as the Young Poet Laureate for Birmingham. 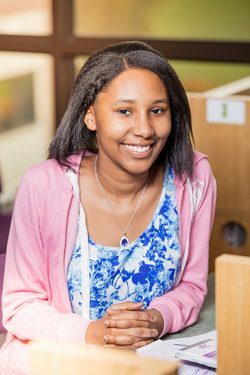 Serena was given the honour after auditioning at the Library of Birmingham in 2014 and submitting a selection of her original poetry. Her position saw her regularly writing new poems and visiting schools to teach young people about poetry. “I’ve been writing poetry since primary school. I wrote a poem for St Chad’s Cathedral at the end of primary school and then in 2012 I won the poetry section of the English PEN competition in London, which was about freedom of expression. I just love poems and enjoy expressing myself in poetry.